3BR, 1.5 Bath house with direct National Park access and great views. Fantastic Location!......... Absolute National Park Frontage and only 600m from Halls Gap town centre. Serenity invites you to relax in a typical Australian bush setting, whilst viewing the animals of our National Park from our magnificent deck, all in the heart of Halls Gap, Grampians, Victoria....Priceless! Our prices are based on an occupancy of 2 Guests. Each additional guest attracts a charge of $25/night and each child (Under 2) stay free. Strictly no pets. Two Queen size beds in separate rooms. Bunks in the kids room for 3. Portacot, Rollaway bed & High Chair available free of charge. THINGS TO DO IN HALLS GAP, GRAMPIANS NATIONAL PARK Watch the Kangaroos feeding at dusk and dawn from your Grampians accommodation. Serenity has an expansive deck facing the Grampians National Park and we guarantee you will enjoy breakfast whilst watching the animals graze in the nearby bush. From your Halls Gap accommodation, stroll along the fire access track (20m past the Serenity accommodation back gate) through the sites and sounds of the great Australian bush and into Halls Gap township for an ice-cream. Take the 1.2 km walk from Serenity Halls Gap to Clematis Falls, which starts 100m down the fire access track (towards town and clearly signposted) and when feeling energetic extend the walk to Chatequa peak, on to Venus Baths and then back into town for another ice-cream, a double header this time! Pack a picnic and drive through the Grampians National Park to Zumsteins picnic area. The Tourist information centre in Halls Gap will provide you with maps. Drive and enjoy a walk to the base of the Grampians Mackenzie Falls or view the spectacular waterfall from the easy to access lookout. Drive to Boroka Lookout providing 180 degree views over Halls Gap and Stawell. Hike to The Pinnacle, one of the Grampians most popular walking trails. In the warmer weather, this is best done before the heat of the day. There are a number of walking options to reach The Pinnacle, varying in distance and difficulty. Visit the wineries of the Grampians together with the neighbouring Pyrenees vineyards, and sample a range of the local produce on offer. No trip to Halls Gap is complete without a day with the family at the Halls Gap Zoo. Check out our blog for more details. Share a meal at our favourite restaurant in town, 'The Kookaburra' and let Von know we sent you! 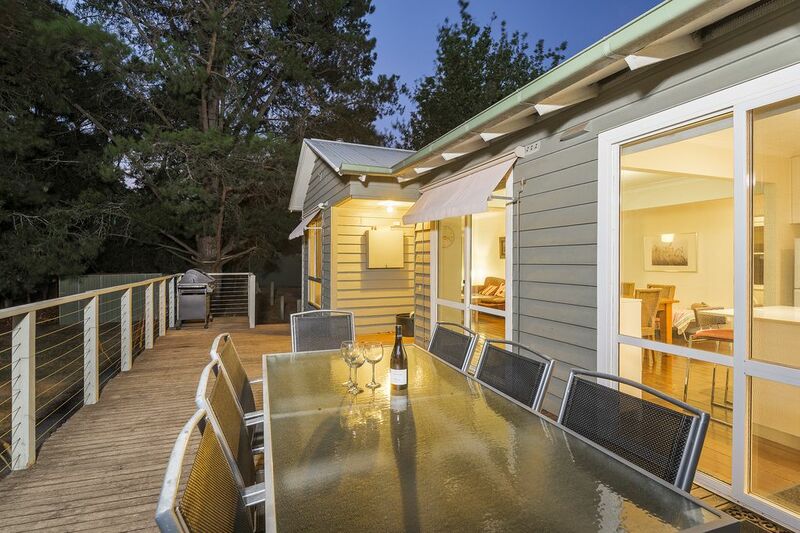 Imagine yourself watching the birds and animals of the Grampians National Park whilst sitting back and relaxing on your very own private deck yet still having the convenience of a 10 min stroll to your favourite eatery or ice-cream shop – Priceless! toilet, Seperate toilet, mirror and trough situated in laundry. We supply WIFI, Foxtel Premium & our linen package, all complimentary: Bathmat Bath towels Hand towel Face washer Cotton sheets Pillow slips Tea towels (Quilt and quilt cover are supplied as standard). Great location windows need a clean. Kangaroos in the back yard..
Serenity Halls Gap is well situated on a quiet dead end street very near the town of Halls Gap. Lots of bird life and daily kangaroo sightings. Lost count of how many times I’ve stayed here. Beautiful house to come back to after a day of hiking. My kids and I love this place in both summer and winter. Glenn is a great host. Do yourself a favour and visit halls gap and stay here. The house has everything you need and is in a great location. No neighbours so it’s nice and quiet and all you have to worry about is saying hello to all the kangaroos and emus. Thanks for such a nice review, I’m glad you love our little slice of paradise as much as we do. We fell in love with the place and the animals of the National Park after renting the house as well, that’s why we bought it! It is a beautiful and very comfortable place to stay. It is also really well located!! We had an amazing stay at Serenity. Our international guests from France and Tahiti got up close and personal with wildlife, dining on the balcony with Kangaroos, Emu, Deer and native birds right on the doorstep. The house is located perfectly, short distance from Halls Gap township but on the edge of the National park. The house itself is perfect for a group getaway. Glen was a great host providing information about local attractions, walks and restaurants. Highly recommend Serenity and would return in a heartbeat. Thanks for such a great review Scott. Yes the native animals come right up to the backyard it truly is the best location in Halls Gap! Watch the Kangaroos feeding at dusk and dawn from your Grampians accommodation. Serenity has an expansive deck facing the Grampians National Park and we guarantee you will enjoy breakfast whilst watching the animals graze in the nearby bush. From your Halls Gap accommodation, stroll along the fire access track (20m past the Serenity accommodation back gate) through the sites and sounds of the great Australian bush and into Halls Gap township for an ice-cream. Take the 1.2 km walk from Serenity Halls Gap to Clematis Falls, which starts 100m down the fire access track (towards town and clearly signposted) and when feeling energetic extend the walk to Chatequa peak, on to Venus Baths and then back into town for another ice-cream, a double header this time! Pack a picnic and drive through the Grampians National Park to Zumsteins picnic area. The Tourist information centre in Halls Gap will provide you with maps. Drive and enjoy a walk to the base of the Grampians Mackenzie Falls or view the spectacular waterfall from the easy to access lookout. Drive to Boroka Lookout providing 180 degree views over Halls Gap and Stawell. Hike to The Pinnacle, one of the Grampians most popular walking trails. In the warmer weather, this is best done before the heat of the day. There are a number of walking options to reach The Pinnacle, varying in distance and difficulty. Visit the wineries of the Grampians together with the neighbouring Pyrenees vineyards, and sample a range of the local produce on offer. No trip to Halls Gap is complete without a day with the family at the Halls Gap Zoo. Check out our blog for more details. Share a meal at our favourite restaurant in town, 'The Kookaburra' and let Von know we sent you! Visit our (Hidden by Airbnb) page or Blog for more ideas on what to do in Halls Gap and the Grampians National park.